If you feel discouraged by stains on your teeth, you should know you’re not alone. Everyone struggles with staining to one degree or another. That’s because many stains are caused by commonly consumed foods or drinks. Coffee, tea, red wine, soda, juice, and other beverages are often at fault. But there are other causes, too, like tobacco use, certain medications, and even aging. All of which makes teeth whitening one of the most popular cosmetic dentistry services I offer. Specifically, I offer two types of teeth whitening: take-home whitening and Zoom! in-office whitening. With Zoom! my patients can come away from an appointment at my Burlington office with a bright, dazzling smile in just a single appointment. This is a great treatment option for patients who need a whiter smile in a hurry. If you don’t need immediate results, take-home whitening can produce the same kind of look over a period of time, and in the comfort of your own home. With specially-made whitening trays and professional-strength whitening gel, whitening at home is easy and only takes about 30 minutes a day. Do you have questions about teeth whitening? Call my office today to schedule an appointment. During your visit, I can explain all your options and recommend the solution that works better for your own situation. 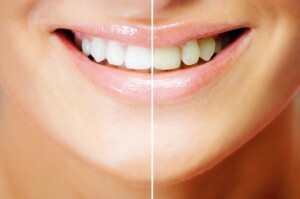 I’m happy to offer two great teeth whitening solutions to patients from Burlington, Bedford, Billerica and Woburn.